The repair & service manuals for off-road or dual-purpose Honda motorcycles we sell, are the best available. Intended and written for the do-it-yourself mechanic, they feature step-by-step photo disassembly and reassembly procedures so you can repair, service or maintain your Honda dirt bike. Fix your Honda dirtbike with a DIY manual! They don't call them "dirt bikes" just because, and if you've been using your Honda motorcycle for a little (or a lot) off-roading, then it will sure need some TLC beyond the quick garden hose bath. The repair and service manuals we sell for Honda dirtbikes, cover the whole gamut: enduros, dual-purpose and motocross bikes. From 50cc on up. And from classic models of the mid 1960s to today's motorcycles. So, if you need to perform basic maintenance on the bike, give it a quick tune-up, rebuild the carburetor or the whole engine, or want to restore an older Honda dirtbike to new condition, check the selection of Clymer and Haynes motorcycle repair manuals we offer. 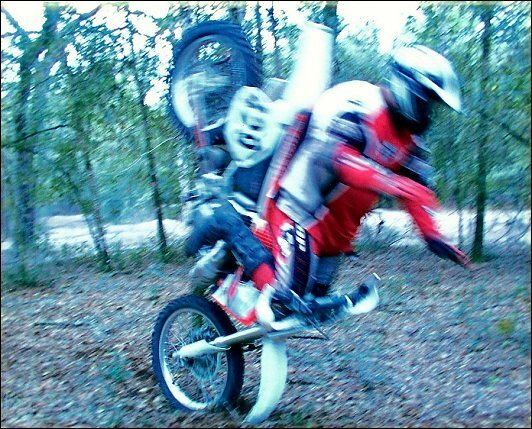 Above: Mark Shepard's version of "Don't Try This At Home" during a ride at Croom OHV Park in Brooksville, Florida. Photo was taken by Joe Shep. The bike is a 2000 Honda CR500R. Harpers Ferry, WV.